Some of the most remarkable fossils of a stemless crinoid species are Uintacrinus socialis. Spectacular examples occur as multiple, intertwined, complete specimens on thin slabs of chalk. The chalks are part of the Niobrara Formation (upper Santonian, mid-Upper Cretaceous) in western America. Many slabs have nothing but Uintacrinus on them. Most Uintacrinus slabs come from western Kansas, but the genus was near-cosmopolitan in its distribution. 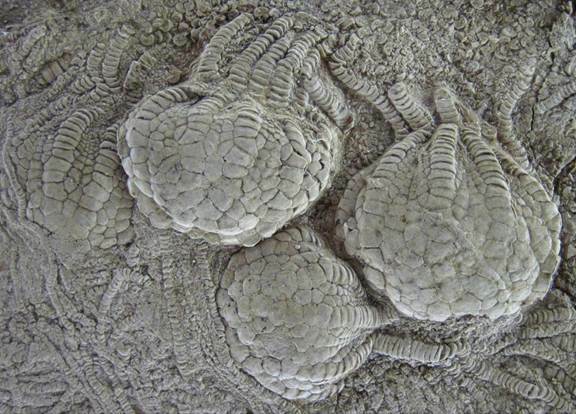 The subspherical calices (heads) of Uintacrinus crinoids were covered with thin calcite plates. Extremely long arms extended from the calyx. These arms are often seen tangled together in the chalk slabs. The largest slabs consistently show the arms of all specimens pointing toward each slab’s center. Preservation of crinoid soft parts has been identified in some Uintacrinus slabs. Black, organic-rich laminations in the slabs have been suggested to represent degraded microbial mats, the presence of which may have promoted preservation of the crinoid tangles. The presence of soft-part preservation permits the use of the term lagerstätte for this deposit. The stemless, float-like calices of Uintacrinus lead to the interpretation that it lived at the sea surface, unlike Paleozoic or modern crinoids, which are mostly sessile benthic. 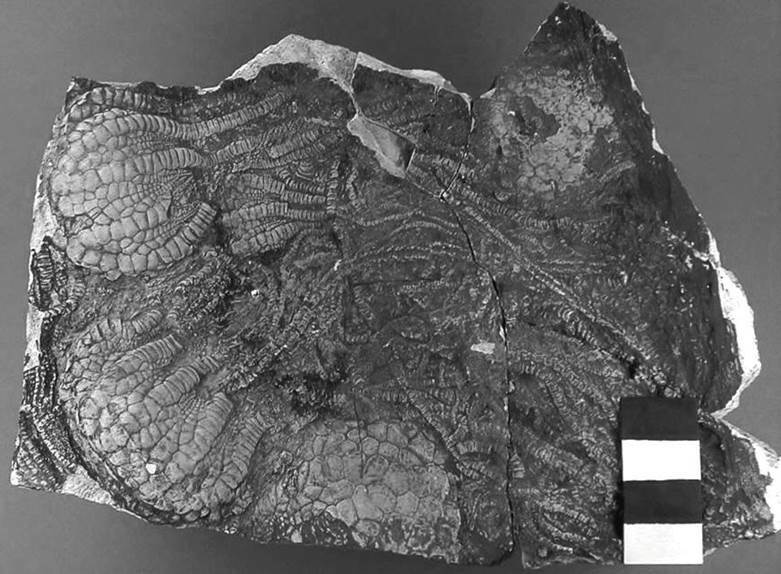 The Niobrara seafloor was not suitable for crinoids having encrusting holdfasts or root-like anchors. Inoceramid bivalves are also found in the chalks of the Niobrara Formation. They had large shells with a spread-out shape to prevent sinking in the original soupy calcareous ooze sediments. Uintacrinus socialis Grinnell, 1876 from the Niobrara Formation (Upper Cretaceous) of western Kansas, USA. Uintacrinus socialis Grinnell, 1876 from the Niobrara Formation (Upper Cretaceous) of western Kansas, USA. Centimeter scale. Most info. provided by Dave Meyer.